This event is being sponsored by Bank of America and The Providence Journal. WEATHER NOTES: There is a chance of a stray shower or thunderstorm during the afternoon/evening. WaterFire will go ahead as planned. WaterFire Providence also thanks the Providence Journal for its continued support. 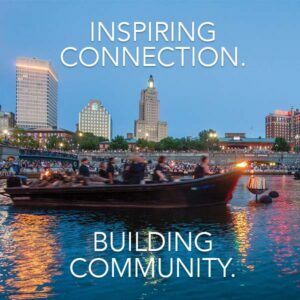 “The Providence Journal is a proud partner of Waterfire because of how it showcases the positive in our community and attracts visitors from afar. 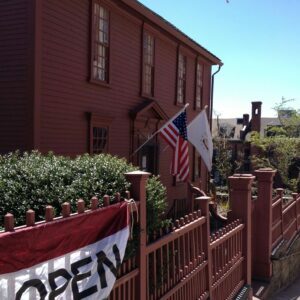 Congratulations and thank you to all of the staff and volunteers that make this event a success.” Janet Hasson, President & Publisher of The Providence Journal. Easily navigate your next WaterFire visit by downloading our new WaterFire Mobile App on iOS or check out the interactive map on our website. 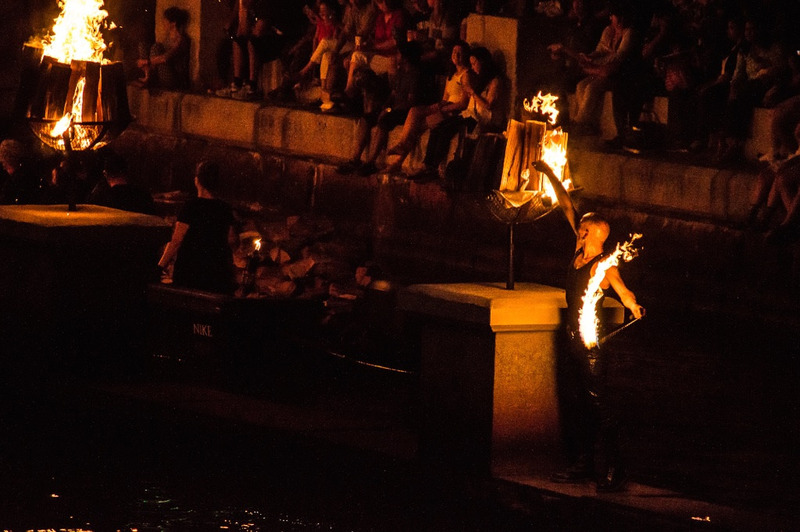 Get a clear guide to major WaterFire landmarks, find places to eat and locate restrooms. 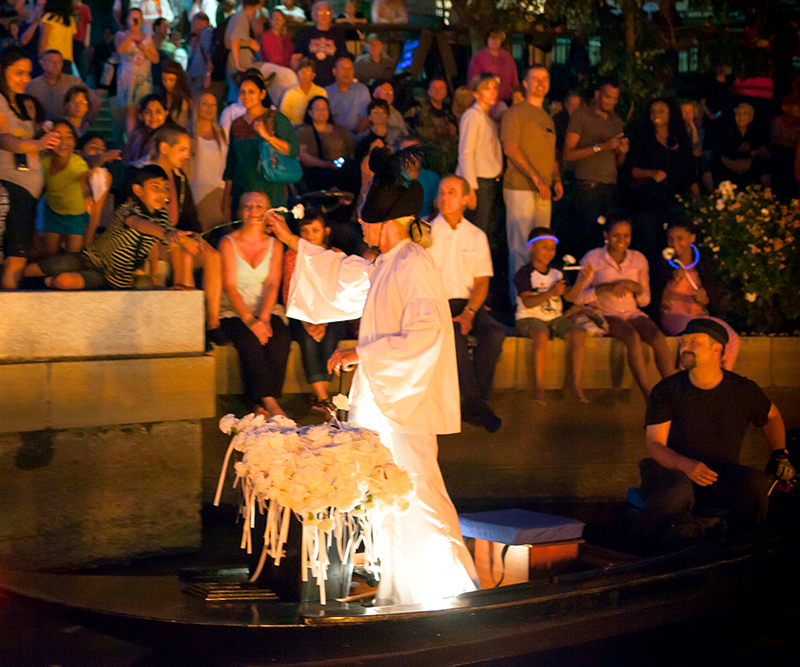 WaterFire is an experience that embraces all of the senses and all of the city! 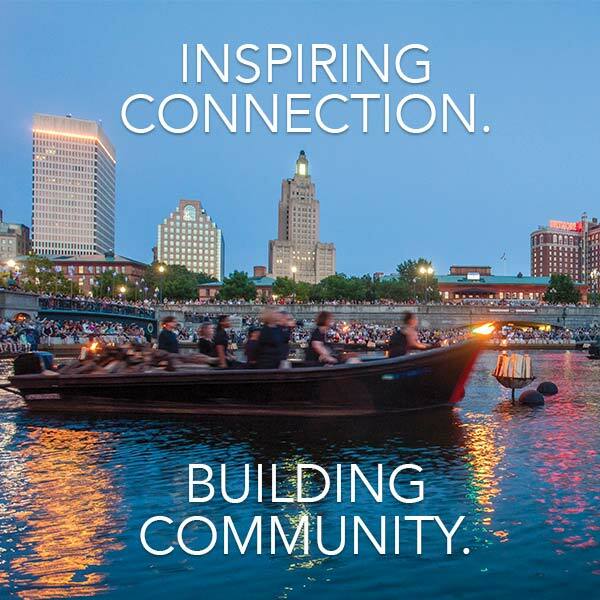 Check out the Plan Your Trip to Providence guide on our website for resources that will help you make the most of your WaterFire experience. Gendo Taiko performs on the Waterplace Basin Stage. Photo by Kevin Murray. 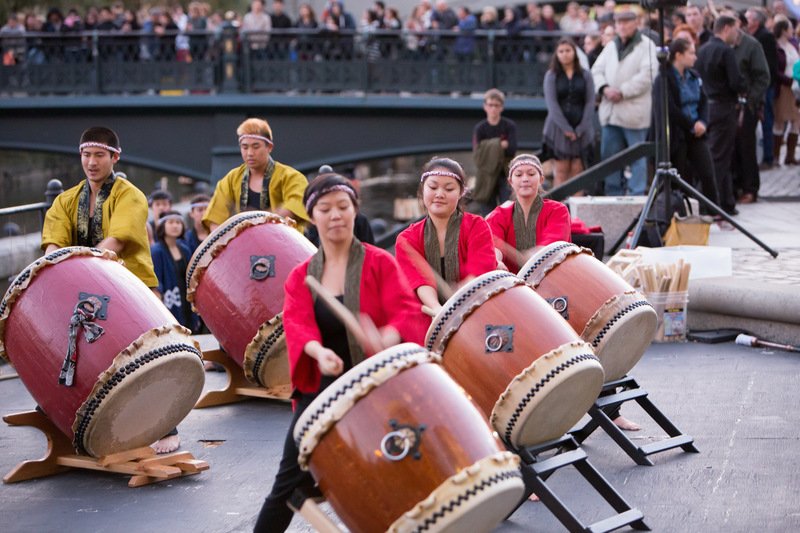 Gendo Taiko, Japanese drumming group, will be performing on the basin stage during the opening ceremony (8:09 p.m.), followed by a second performance at later in the evening. Gendo, loosely translating to “path of free imagination,” represents the journeys taken by members in years past, and the experience of creative inspiration they hope to pass down to future members and audiences in the years to come. The Starry, Starry Night Installation will shine brightly in Memorial Park. Join thousands of WaterFire visitors in Memorial Park where the public is encouraged to add their own light to the night. For a small donation to WaterFire, make a wish upon a star or make dedication with a luminaria candle lantern in the park. The park will be aglow with hanging blue stars and a constellation of twinkling luminaria candle lanterns below. Andrew Lindsay lights the braziers on the Wall in Memorial Park. Photograph by Shaun Martins-Torres. 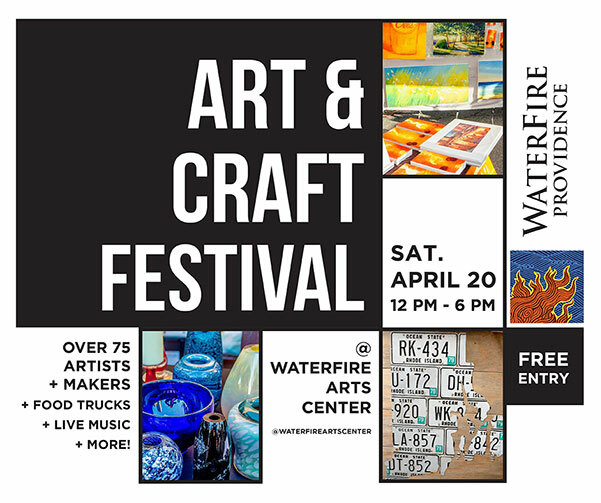 Fire Dancers Andrew Lindsay and Liz Knights from Cirque De Light will dazzle the crowds during several performances throughout the evening at the confluence, on boats, and on the wall of braziers near Memorial Park. 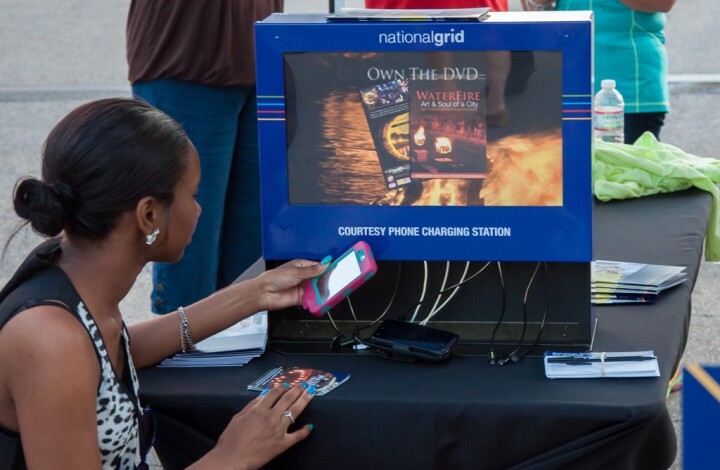 Make sure you can capture the magic of WaterFire all evening long by visiting National Grid charging stations on College Street and Canal Street to recharge your smartphone and other mobile devices during the lighting.